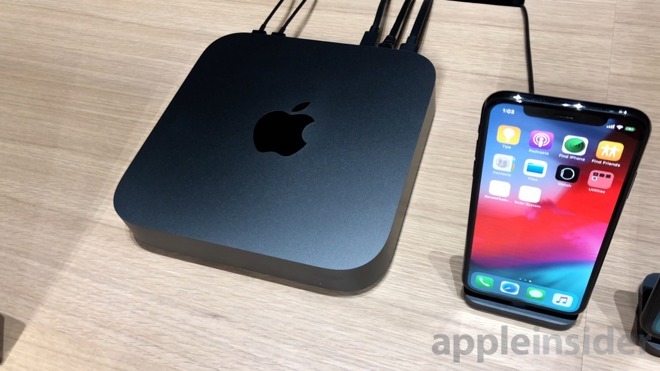 Apple retained the rounded square exterior of the Mac mini, including the user-accessible bottom and a lineup of ports on the back. Mac mini's small but vocal user base was clearly heard as Apple took a lot of their considerations to heart. Memory consists of two user-upgradable SO-DIMM slots and the flat body design makes it a great choice for server farms. On the back we found several Thunderbolt 3 ports, HDMI, USB-A, audio out, and a Gigabit Ethernet port that can be upgraded at purchase to a 10-gig port.. What we found most impressive was a stack of five Mac Minis, connected over Ethernet, running tasks assigned by Final Cut, Logic, and Xcode while the primary machine carried on with its normal tasks. We love the space gray body, but Apple maybe should have called it the Mac mini Pro to go with the Space Gray iMac Pro. The body, made from a proprietary recycled aluminum, looks the same as any other Apple aluminum other than the color as far as we could tell. 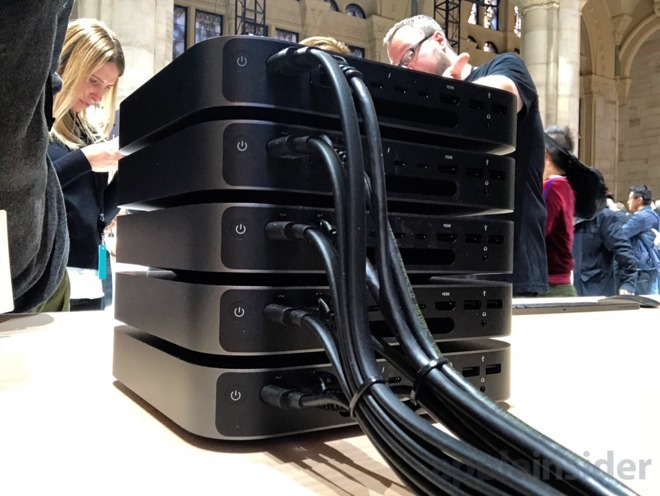 The real test of the Mac Mini is how it does in performance and that is something we could only scratch the surface on in Apple's demo area. We'll have the machines in our lab soon to put them to the test to see how they actually line up. Apple's new 2018 Mac Mini is available to order starting today starting at $799.